Written at 07:53:09 on Saturday, 9th December, 2017. 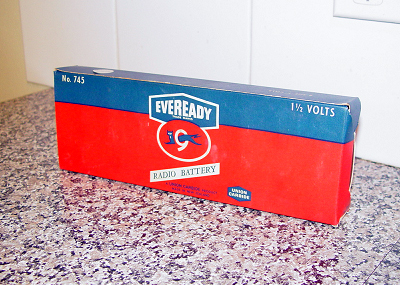 Before electricity became commonplace people had to run their radios from batteries. It wasn't as simple as going to the supermarket and picking from a few different sizes and then just slipping them in. 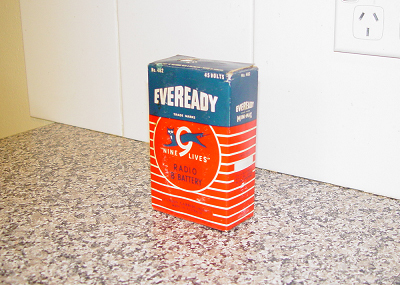 Unlike today's portable appliances, the earliest valve radios required at least two different batteries and sometimes three. Batteries didn't cost a few dollars for a packet of four cells either. Although the term "few dollars" is relevant. Among my collection of radio batteries there is one with a price tag showing $2.30 and the sold date on the battery is 19th April, 1968. The average weekly wage would have been around $35.00, maybe $40.00 at the time, making this battery a rather expensive item. It'd be the same as paying $50.00-$60.00 for a modern equivalent. With so many services that people pay for now, it would be hard to imagine someone paying half a day's wages for a battery, no matter what it was for. Below are some pictures of my radio battery collection. This collection consists of 'A' batteries, 'B' batteries and 'C' batteries, plus a couple of the later 'transistor' batteries which were common when I was a lad. At this stage please note that these letters had nothing to do with the physical size of the batteries like they do today. They signalled what the battery was to be used for. 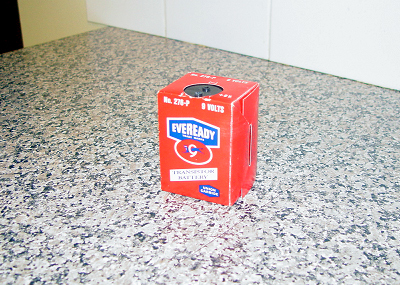 'A' batteries were always large objects and consisted of several 1/5 volt cells wired in parallel and these were used for heating valve filaments. In the earliest times 'A' batteries were just 4 volt lead-acid batteries as this voltage suited the valve filaments of the time. When the first station dials came about, 'A' batteries also supplied power to the optional dial lamps. As time went by zinc-carbon throw-aways became cheaper than taking a lead-acid battery to the local garage for recharging. 'B' batteries were a lot smaller because the voltage was much higher and the current flow much smaller. 'B' batteries were used for supplying power to the radio circuit and the total voltage was usually between 67.5 volts and 135 volts. The 'B' batteries in the following photos show both a 67.5 volt type and a 45 volt type. Combinations of these wired in series gave the radio its required voltage. A word of warning about 'B' batteries - if you have greasy or wet fingers, do not handle them. Electric shock is a real possibility. 32 volts AC at 50mA is enough to kill, as is 110 volts DC at the same current flow. 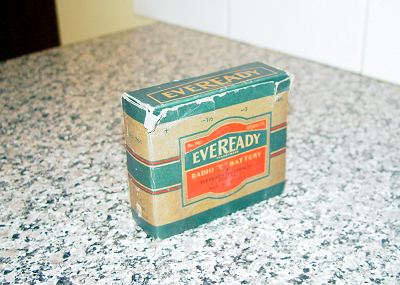 Some radios only required an 'A' battery and a 'B' battery. 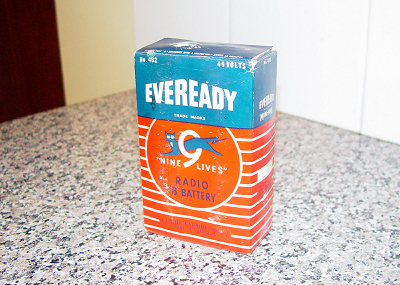 Many other radios also used a 'C' battery for valve grid bias. 'C' batteries were almost always 4.5 volts with extra taps for 3 volts and 1.5 volts. Two in series could make 6 volts, 7.5 volts or 9 volts but these voltages were not common for this purpose. Lastly, I have two 'transistor' batteries in my collection. There were a couple of other sizes but for more than half of the early transistor radios, these two sizes fitted the bill. They are both 9 volt types though with different current ratings. The larger one here has a plastic frame inside to accommodate 6 modern C-size cells. This particular one was equipped with cells of the 'Embassy' brand, which was sold at Coles-New World supermarkets a long time ago. 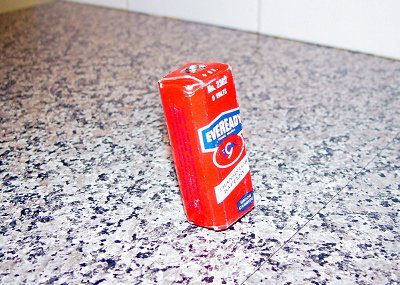 And we all thought that generic brands were a modern idea - not so. 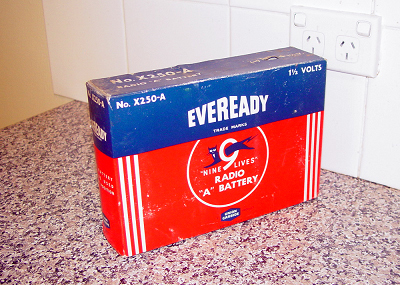 In summary, the above examples were commonplace but only a small sample of the number of types available during the era of battery-powered valve radio. As my collection of batteries increases so will the number of photos here. There are 8 visitors on Vintage Radio now.